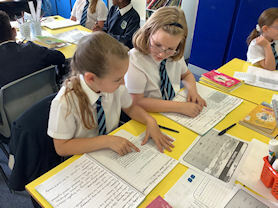 Welcome to Year 4 where we aim to provide a positive learning environment in which all children are encouraged to reach their full potential by being fully engaged in their learning. By following in the footsteps of Jesus and showing they are signs of God’s love children become confident learners, supporters and friends. Our aim is to give each child the stability they need to become well rounded individuals who are well prepared for the next academic year. 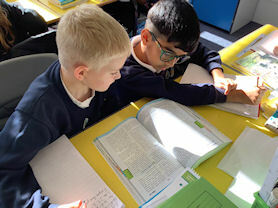 The classroom is a stimulating environment which motivates children to work hard and achieve highly whilst having enjoying their learning. 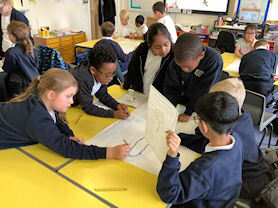 During Creative Curriculum Challenge we provide the children with a broad, balanced education covering a variety of topics and catering to the needs of all children. 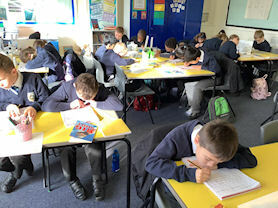 Concentrating hard in an RE lesson. Our anti-bullying song in PSHE.